White Chocolate Halloween Popcorn - Made It. Ate It. Loved It. I have always been a huge white chocolate fan. Believe it or not I am really not a huge chocolate person. I know I know how can a foodie not be a chocolate person…well here I am. I don’t think milk or dark chocolate much but on occasion I can down a good amount of white chocolate. And when I do it is usually on popcorn or a caramel apple. Which I have had both of those this week. Haha Halloween cooking and baking has been in full force this week! And I can’t wait to share all the recipes with you. So next up in this white chocolate popcorn. 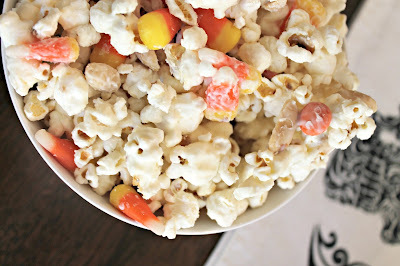 I like to pop my popcorn fresh but I know stores offer great bags of popcorn or just popping your popcorn is great to! But if you can grab some popcorn seeds and pop your own! Make the popcorn in a popcorn popper by placing a little oil in the bottom of a heated popcorn popcorn and place 1/2 cup of the seeds down. Pop as directed on back of popper and then pop the other half of the popcorn. 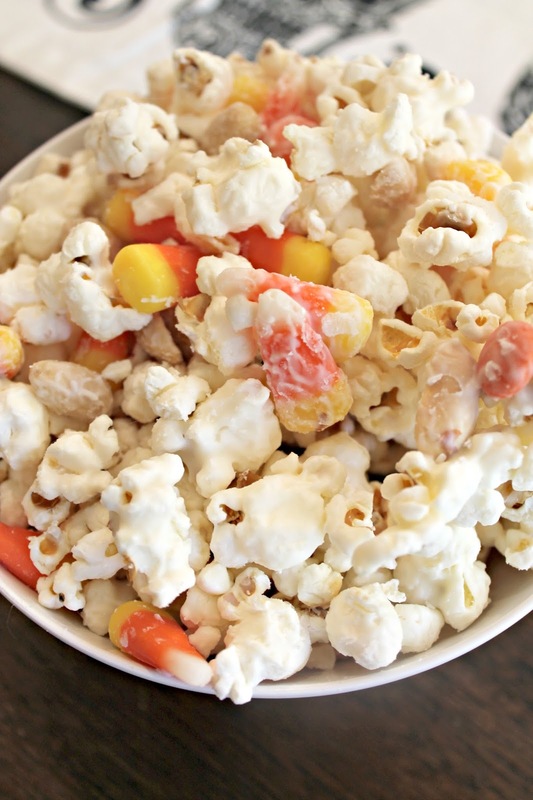 Place the popcorn on a tray or in a large bowl. Melt 1 bag at a time of the white chocolate morsels in the microwave at 75% power for 3 minutes stirring every 30 seconds until it is all melted. Repeat with the other bag of white chocolate. While the chocolate is melting add the peanuts (you can add more or less if you prefer). Then once the white chocolate is done pour over popcorn and begin to store. Then pour in reese’s pieces and candy corn and stir popcorn more until candy is coated. 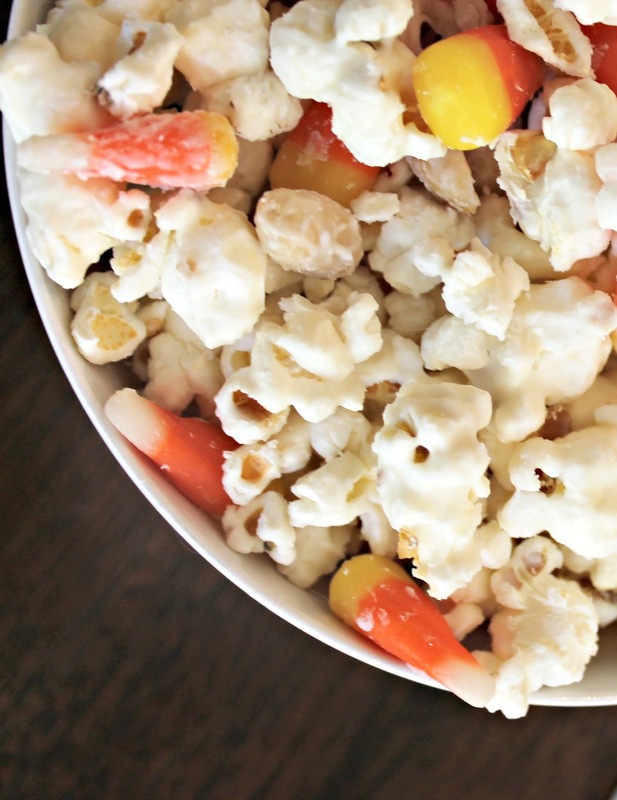 You can add more white chocolate or toppings depending on how you like your popcorn! Let sit for 30 minutes to harden and then enjoy! Berry Cobbler in a MUG!